When Will I Get My Double Parallel Fold Newsletters? 5,000 and under Double Parallel Fold Newsletters: Ships or ready for pick up in 2 business days from proof approval. Over 5,000 Double Parallel Fold Newsletters: Ships or ready for pick up in 5 business days from proof approval. 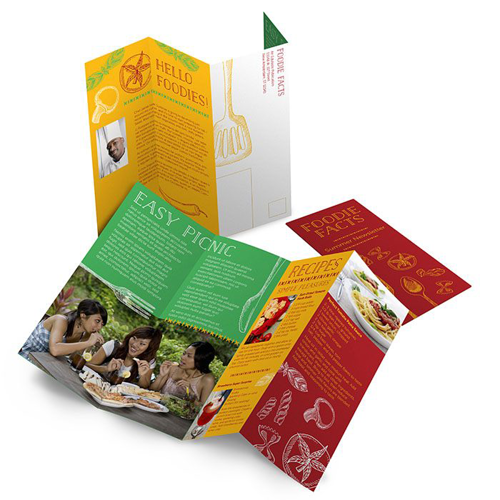 Double parallel fold newsletter printing can double the impact! Try double parallel fold newsletter printing and your target audience may do a double take when your next newsletter arrives. Double parallel fold newsletters are fun, fresh and inviting! Use our online newsletter printing services and you get high quality double parallel fold newsletter printing at prices you can afford. You also get the benefit of our industry-leading 48 Hour Turnaround Time Guarantee for quantities of 5,000 or fewer newsletters. Double parallel fold newsletter printing could double your readers’ pleasure and double your fun! Use the four individual panels on each side or double them up to convey key messages with striking visuals and interesting copy across more than one panel. The design variations make double parallel fold newsletters lots of fun to design and read. Double parallel fold newsletter printing can help you optimize your design space to create a truly compelling newsletter. In addition to our single fold newsletter printing services, you can also choose from no fold newsletter printing, single fold newsletter printing, tri-fold newsletter printing, accordion fold newsletter printing, french fold newsletter printing, roll fold newsletter printing, and gate fold newsletter printing. We have newsletters covered!